His heart was not pumping properly, and an alarming test told them that it was functioning at only 8 percent of its capacity. Doctors called this barely life sustaining. Mark was now confined to a hospital bed where only limited movements were allowed and a mechanical pump was surgically implanted in the left side of his heart in order to keep him alive. This was a bridge to sustain him until a transplant could be found. 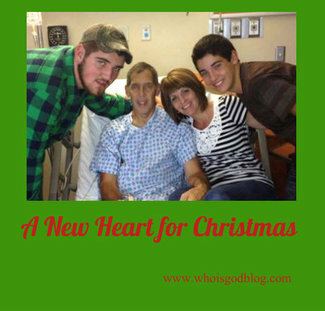 Today, Mark is on the heart transplant list, and he and his family are praying for a new heart for Christmas. They’re also respectfully praying for its donor. The waiting is tough for Mark and his wife, Kim. They’ve had their share of dashed hopes from false alarms or “dry runs” as the doctors call them – transplant possibilities that didn’t work out. They don’t know exactly why it’s taking so long. And Mark is more than ready for his new heart. “There’s a reason why we’re waiting, “ says Kim. The goings been tough for this family of four, and to me, well the meaning of Christmas shines through it. Christmas means different things to different people. To some, it’s a treasured holiday that’s anticipated all year long. And to others, it’s merely tolerated and at best avoided. My family and I have been hooked on the Hallmark Channel lately. Throughout December, they have been playing a good deal of made-for-TV Christmas movies that often have a good, wholesome message about the Christmas holiday. Usually, there’s a character who doesn’t like or celebrate Christmas, and they come head to head with someone who lives for it. You can probably guess the ending of most, the scrooged-out person, through a turn of events, has a change of heart and learns to embrace Christmas. The shows, although not Christ-centered, are heart warming and family focused. And its good to see folks essentially get a “new heart” for the holiday. It’s actually kind of like the heart change that happens when a person who has been far from God decides to return to him, or come to him for the very first time. Because, you see, at that moment, someone is receiving a new heart. Let’s slow down this busy Christmas season and take a moment to pray for new hearts. Pray for Mark who waits for a new heart to help give him back the active, healthy life that he once had. And let’s pray for our neighbors next door, friends from work, that lonely relative – or maybe its you who also could use a new heart in Jesus this Christmas. 26 And I will give you a new heart—I will give you new and right desires—and put a new spirit within you. I will take out your stony hearts of sin and give you new hearts of love.